There is mercury along the creek bed because the "idiots in charge" decided it was a good place to put the byproducts of the mining that was going on in the early european days of San Jose. Quicksilver mining to be exact. And we all know that the byproduct of Silver mining is mercury. They would use mercury to extract the ore (silver) from the bedrock. They knew that mercury is very harmful. So why in the world would you put it in your water supply? So to clean up this lovely mess, the water district hires a construction company that specializes is hazardous waste. It was two backhoes and a water truck. They would dig out the soil along the creek to just below the water level. (they lined the creek with silt paper and hay to minimize the creek water spilling over) They had one guy using a fire hose hooked up to the water truck, he sprayed the work area non-stop. Apparently, the mercury is only harmful to us, if it gets airborne. So if you keep the dust down with constant water... no mercury poisoning. So besides me (the archaeologist), the water district people and the work crew, there were two people from another company who specialize in hazardous soils and air. They set up air quality monitors all around the site and on two of the workers. So that if mercury was in the air, the monitors would go off, and we would get the hell out of there... fast. That never happened though. We were all given masks, but wearing them was not enforced. And my shoes are still on the front porch. I haven't gotten around to washing them. It was an interesting day. The crew was nice, and the water district people were nice too. So, why was I there? Well, I was there to make sure they didn't dig anything or anyone up besides the hazardous soil. A couple years ago now, you may remember or not, that they found a mammoth on the Guadalupe River. The area where we were working has a lot of history (mining, and indian). I did find lots of freshwater shells (modern, ie not eaten by indians or miners), deer bones, and old glass bottle fragments, and of course beer bottles and cans and plastic grocery bags. So what did I learn? That I really need to get my Hazwhopper certification training, and that San Jose has Salmon runs. I'm a bit concerned that the salmon run up streams with mercury poisoning, but I'm sure there are lots of other bad things unseen in our waters. The moral of this story is... All this time, money, and risk to our health could have been avoided if the mercury was disposed of properly in the first place. Now it gets dug up and trucked off to a hazardous waste dump facility near Kettleman City and new soil and rocks get trucked in to replace it. Cleaning up the mess left behind by our forebear's is not new, nor will it every really go away. Some of the "idiots in charge" today, are doing the same bad things, with the "out of sight, out of mind" mentality. It makes me mad to see the effects of it all. I'll get off my soapbox in a minute... What really erks me and what I see the most is garbage everywhere. I'll be in the backcountry somewhere at an arch. site and low and behold Budweiser bottles, plastic whatever, and cig. butts. This "out of sight, out of mind" thing is flawed, cus just because you don't see it, someone else does. I decided one time to pick up the garbage along a Forest Service road (behind a locked gate) and had to stop because I filled up two grocery bags, and was spending too much time (I was suppose to be working). I do try to pick up stuff and deposit it to a local garbage can. Okay, I'll step off now. Do something good every once in a while. Pick it up, because otherwise it will end up in our streams, rivers, and beaches if we let it. Welcome to my blog. Just a reminder, this is a *private blog and only those I have selected can read this (unless I get hacked). Some ground rules... I'd like to keep my name private, hense the name "The lonely Traveler", besides, you all know who I am. I will also not divulge any of your names without permission, nor will I post pictures of people other than myself without permission. And I hope you all will do the same here. Okay, so enjoy. Check in as often as you like. I will try and keep this updated as much as possible. *If someone is actually reading this, it is no longer a private blog. I'm open to the public. Oh, that sounds kind of dirty. Okay, here it is in technicolor and everything. I arrived at the Visalia municipal airport at 8:45 am and my flight was at 9:30. I watched the helicopter come in. 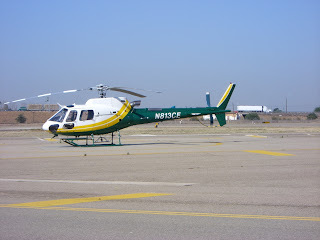 He flew in from southern California (Rosemead) and had three passengers with him from SCE (Southern California Edison). There were 11 of us. 9 from SCE, me (the archaeologist), and a biologist. Lets see, there was the project manager, environmental planner, two road story guys (they build the access roads to the towers), engineer (the guy who builds and places the towers), another biologist, and some other people who's jobs I have no idea. So I was on the first flight. The helicopter will seat four passengers. I sat behind the pilot. I was with the two biologists and some other guy who got to sit in the middle on all the flights (he was there for continuity) Our flight was an hour long. It wasn't as loud as I thought, and very smooth. We wore those "oh so stylish" headsets. and pushed a button to talk to each other. The view was awesome. 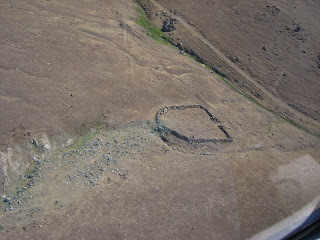 You really can see BRM's (bedrock mortars – the grinding holes that indians used to grind seeds and nuts) from the air. I have a picture, but you can't see the holes unless I really zoom in. I didn't get too sick. I started to get a bit sick, but that was because I was looking down and swinging myself around to see stuff. So I sat up and focused on the mountain for about five minutes and then I was fine. I can't wait to do it again. I hope I get another opportunity. Those SCE people get to do it all the time. Of course they have a fleet of helicopters and they employ I think four pilots. So, I've attached a few photos. and was built prior to 1870. It is also the place where two famous train robbers where shot by the US Marshals and a local posse. 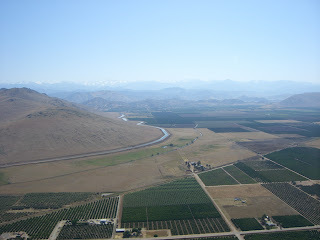 Number three is a view of the general area with the orchards and the Friant-Kern canal and the snowcapped sierra's in the far background. Okay, this is long enough. I hope you have enjoyed this installment of the life of a local archaeologist (my job is so cool). Addendum: Since this was originally written, I have gone up for a second ride. Not quite as enjoyable but exhilarating, nonetheless. I flew out of Big Creek (a town in the Sierra’s, that is the headquarters of SCE for the area). There were two biologists (one was in training), our guide from SCE (I have a story about him, but I’ll save that for later), and myself. We were surveying areas for potential helicopter landing sites. And so the fastest way to get to these sites is to fly to an existing helicopter landing site, and then driving/hiking from there. So the flight was about 15 minutes as opposed to 2 hours by car. So that was nice. But it was a bit too windy where we were going. The helicopter was getting blown around a bit. And it was too windy to land. The pilot (he was great) came in to land us and almost stalled, so he flipped us around for another go, and almost stalled again, so flipped us around again… He safely landed on the fourth try, but told us he will not be able to pick us up for the trip back, it is too dangerous. Lucky for us, SCE stashes vehicles and emergency equipment at certain places, and we happened to be at one. So we had a truck to get us back to town when we were done surveying. This has not put me off flying in helicopters. I actually felt quite safe, more so than in a plane. Not sure why though.